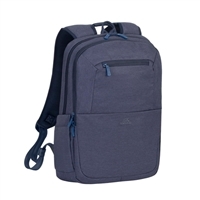 Active-style, lightweight 15.6'' laptop backpack. Made of high-quality water resistant material and has thickened sides to provide extra protection from accidental damage. Main vertical load compartment has soft sides and a strap for your 15.6" laptop. Additional inner pocket for Tablet up to 10.1". Front storage zippered compartment holds an organization panel with slots for business cards, pens, MP3 player, smartphone and USB cables. The backpack has special side-pocket for bottle of water. Dual zipper pulls for easy, quick access. Comfortable soft handle and shoulder straps with softened bands will make you feel comfortable on a longest journey. Trolley pocket helps to attach your bag to your luggage for an easy transportation. Hidden zippered slot on the back panel for passport or wallet. Front storage zippered compartment holds an organization panel with slots for business cards: pens: MP3 player: smartphone and USB cables. Trolley pocket helps to attach your bag to your luggage for an easy transportation. Hidden zippered slot on the back panel for passport or wallet. 11" x 15.2" x 1.57"
11.42" x 16.93" x 5.7"